The Mediterranean diet is based on the eponymous pyramid. For your ease, we have divided the pyramid into frequency of consumption. That way, you will know exactly how often to eat them. Another sub-category indicates the kinds of foods included in a layer. Whether it is rice, pasta, or bread, as long as it is wholegrain-based food, you can enjoy it daily and at every meal. Just restrict the portions and you will do well. Whole grain products still retain the nutrition unlike processed ones. 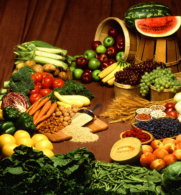 Another critical food group that you need a daily dose of includes fresh fruit and vegetables. Don’t run after exotic out-of-season stuff but try to shop for local produce that is available seasonally. Moreover, don’t discount the seeds, beans, and pulses. Throw away the margarine and butter because they are both processed spreads. What you need is the freshest possible olive oil. Make it the source of fat to be consumed daily. Your body needs calcium frequently, if it is to maintain bone integrity. Dairy products are a rich source of calcium. When you shop for dairy, look for products made from sheep and goat milk. That includes the delicious feta cheeses and fabulous mozzarella cheeses. These cheeses will contain lower amounts of fat as compared to cheeses made from cow’s milk. The Mediterranean diet encourages consumption of fresh oily fish for two reasons. The fish is a source of protein and Omega 3 oils. While the human body has plenty of the former, it can’t auto-synthesize the latter. These oils have an important role to play in the development of body and brain. Look for low-fat turkey or chicken, which are lower in fat as compared to goose and duck. Both are good sources of protein. An egg is protein-rich, which makes it a good source of the nutrient. The reason why the Mediterranean diet limits its consumption to a few days per week is its slightly raised cholesterol level. You can turn every egg meal into a healthy one by changing the way it’s prepared, such as boiling instead of frying etc. Look for organic and free range varieties. A dessert in the Mediterranean diet is more often fruit or cheese than some creamy confection. If you love cakes and meringues, enjoy them but in moderation. Unlike most diets out there, the makers of Mediterranean diet didn’t believe in limiting a person from foods that they enjoyed eating. In that spirit, there is a layer on the pyramid dedicated to red meat! The only caveat suggested by the diet is that it is only eaten a few times each month. Don’t think of the Mediterranean diet as just a diet. Think of it as a healthy plan that will let you enjoy your life to the fullest and lead to an active old age! Following the pyramid should be easy enough to adopt this lifestyle and change your shopping and eating habits. Check out Chef Ayhan’s book on Amazon for help on all things Mediterranean!